At first, it's just the windows I hear as they rattle in their frames, but it's nothing so powerful as to wake me entirely. My heavy eyelids drift back together and I catch the flickers of my last dream just before they disperse for good. Then the rattling becomes stronger, and my eyelids pull apart, this time wide, imagining the panes as they burst into a thousand tiny shards and rain down on me. My mind has stirred and I hear the wind behind the windows, and between its ebbs and flows there is heavy rain pattering down into an empty street five floors below. Then the wind returns in an almighty bout, a bout that hurtles down the side street and pushes through the slats in the shutters like a chord through the reeds of an organ, and with a crash forces open the balcony doors, and the rain and the cold come billowing in and the net curtains are left grasping to their railing. This morning's storm confirmed the arrival of the windy season, which will last throughout winter and until the end of spring. The winds will charge across the Mediterranean coast at regular intervals, each interval (known as a نوة | nawwa) arriving at the same time each year, and each lasting a predictable number of days. Each interval has therefore become known by its own unique name, this first one of the season being the Gale of the Broom. A couple of these windy intervals have clearly Christian names, because their arrivals coincide with important dates in the calendar of the Copts, who must have been the first people to coin these names. 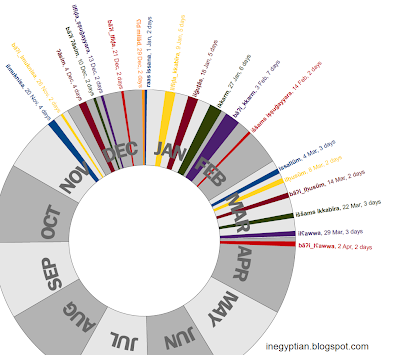 The Coptic calendar grew out of the Ancient Egyptian calendar and is made up of 12 months of similar length to Gregorian months, and a thirteenth month of only four or five days. The seventh month is called Paremhat (which occurs between 10th March and 8th April in the Gregorian calendar), and the first seven days of this month is known as Husum. These seven days are popularly believed to be a bad time for planting. As you might expect, نوة الحسوم | nawwit ilḥusūm arrives at the same time as this special week. 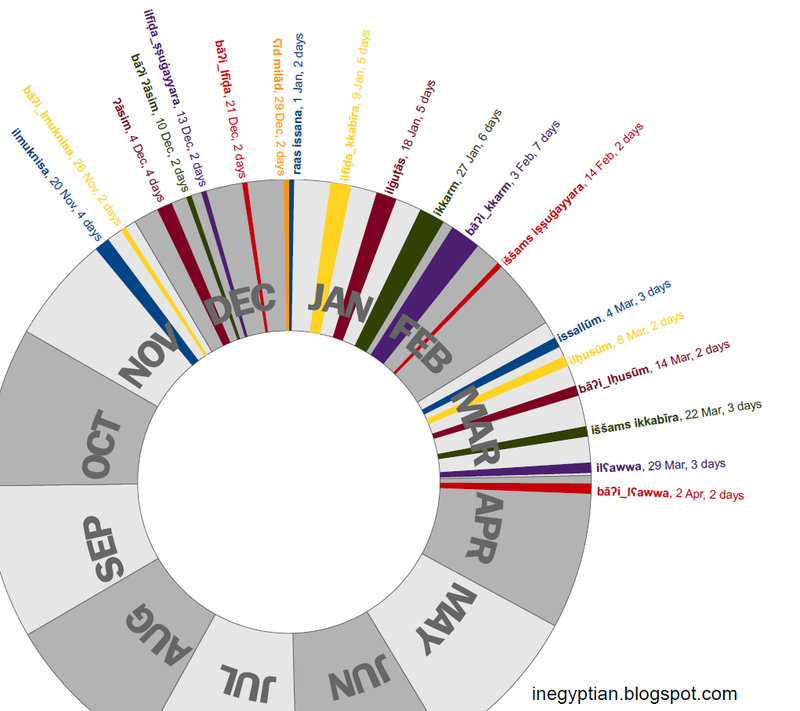 The way in which the other windy intervals relate to the relate to the Gregorian calendar can be seen in the graphic below (click the image to view it in full-size). 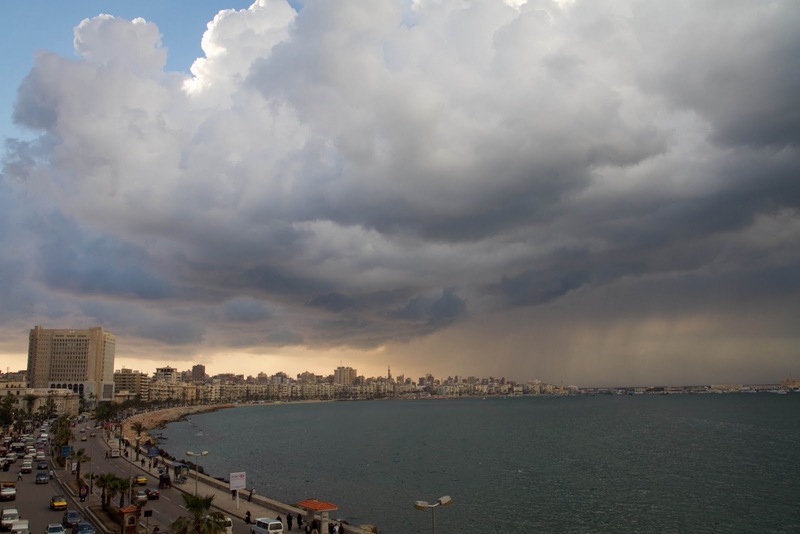 The Coptic calendar is still used in Egypt (alongside both the Gregorian and Islamic calendars) not only for certain aspects in the realm of weather but also the realms of agriculture and fishing, these three realms being what mattered to the Coptic civilisation and the Ancient Egyptians who preceded them. Coptic was the main language of Egypt until the Arab conquest in 641AD (that's the Gregorian calendar!) and eventually died out as a spoken language a few centuries later. Certain items of Coptic vocabulary survived in Egyptian Colloquial Arabic, much like certain manifestations of the calendar have survived into modern times. Egyptian Colloquial Arabic is of course unique among the Arabic dialects for its inheritance of Coptic (and by extension, Ancient Egyptian) words.